The Jakarta Maritime, Agriculture, and Food Security (KPKP) Sub-dept. is holding urban farming development guidance at Cakung Barat Flat (Albo Flat), Tipar Cakung Flat, and KM 25 Flat, East Jakarta.
" It's also to add green open space in the capital"
According to Diah Meidiantie, Section Head of Agriculture for Jakarta KPKP Dept., the activity that is attended by 100 residents from the three towers is aimed at providing education about the use of farming space, as well as inviting residents to start a healthy lifestyle by consuming healthy and nutritious agricultural products. "It's also to add green open space in the capital," she expressed. 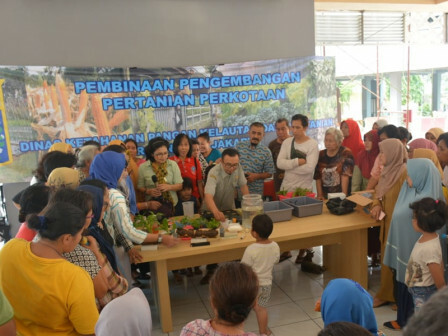 Aside that, the activity also plants 290 productive trees, starting from avocado, star fruit, duku, gandaria, guava water, jambu bol (ripe Syzygium malaccense), cashew, harp, kemang, kokosan, and mango. "We plant 110 trees in Cakung Barat Flat, 90 trees in Tipar Cakung Flat, and 90 trees in KM 25 Flat," he expressed. Cakung Barat UPRS Head, Bahrudin hoped that the dept. could continue to provide assistance to the flat residents thus the city's agricultural development can be implemented in daily life. "We will invite them to jointly maintain and care for the productive trees that have been planted, thus the location of the flat can be greener, cleaner and healthier," he uttered.